I love fall but hate it all at the same time. I love the cooler evenings and the changing leaves, but I hate that winter is literally looming around the corner. I feel like its going to come sooner than normal this year as we’re trending about 10 degrees cooler than average right now (secretly I’m still rooting for an Indian Summer, but that’s just me). I’m not ready for 30 degree mornings yet – yes I said it, 30 degrees…we’ve already had one and it was awful! 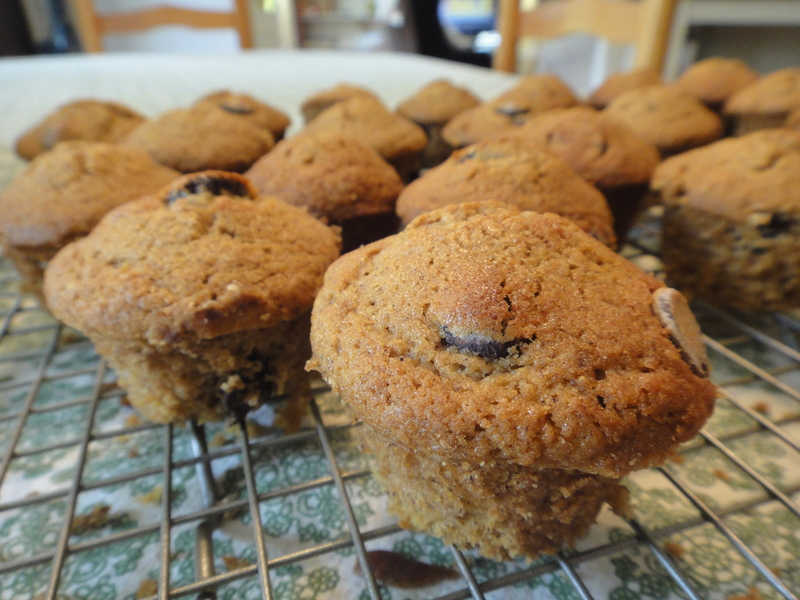 All that babbling aside, the cooler temps and the county fair last week made me crave one of my favorite fall baked goods: Pumpkin Chocolate Chip Muffins. I’m seriously nuts about them! I love them so much that I used to hide them under my bed in college so my roommates wouldn’t know I had them (so horrible, I know!). I personally like these muffins better after they’re a day old because they settle and become more dense (personal preference). And of course, what’s a Pumpkin Chocolate Chip Muffin without a warm glass of Caramel Apple Cider (really simple, pour some caramel – think quality ice cream topping- in apple cider and pop in the microwave for a few minutes)? Grease mini muffin pans. Mix flour, sugar, spice, baking powder, baking soda, and salt in a large bowl. Break eggs into another bowl. Add pumpkin and butter; whisk until blended. Stir in chocolate chips. Pour over dry ingredients and fold in with a spatula until moistened. Scoop into cups and bake for 20 minutes. Cool on wire rack and store in a covered container.